12/14/10 - Reproduction is getting so complicated. In the old days, you had only two biological parents — Mom and Dad. But now, up to two women (three if you count a surrogate carrier) can be the biological mothers of one baby. As far as biological fathers go, though, it’s always been one per child, except in very rare genetic conditions — until recently, that is. A mouse with two dads could change that — although the technique used to produce this mouse is a very long way from being practical or ethical in humans. 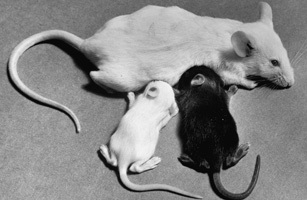 The research, which produced both male and female mice with genetic material from two fathers, was just published in the journal Biology of Reproduction. The procedure was incredibly complex, creating offspring with multiple possible parents. “It was a weird project but we wanted to see if it could be done,” lead researcher Richard Behringer told the Wall Street Journal. Here’s how it worked. In order for a mouse, or a man, to be male, he has to have both an X and a Y chromosome; females have two X’s. So, researchers took a cell from a male mouse fetus — let’s call him Mickey. Mickey’s chromosomes, like those of any normal male mouse, were XY. Mickey’s embryonic stem cells, which are capable of becoming any type of cell in the body, were programmed to copy themselves. About 1% of the copies wound up losing their Y chromosome, producing XO cells. That happens normally, as cells don’t always reproduce perfectly. The XO stem cells were then inserted into normal mouse embryos, which had completely different parents, one male and one female. The babies born from these embryos are called chimeras — some of their genetic material came from their parents, while the rest came from Mickey. Not to mention a few mothers in the middle! As you can see, this technique would be extremely impractical and morally questionable for human use, for a great many reasons: because of the fetal cells and multiple generations involved, the use of chimeras and the inevitable production of additional offspring who aren’t genetically related to the fathers. Not to mention that human women who have the XO chromosomal configuration are infertile and may suffer other health problems. However, the reproductive strategy could be useful for animal breeding, especially in endangered species. And perhaps someday it could lead to the development of technologies that would allow gay male couples to have their own genetic children.